Available in 18" and 24" widths and 36", 48" and 60" lengths. Complete shelving unit in one box. The combination of numerically-calibrated posts, tapered split sleeves, and shelf collars makes assembling these units a simple, three-step exercise: assemble two-piece post by threading top half onto bolt in lower half; 2) snap split sleeves onto post over number of your choice; 3) and slide shelf collar over split sleeves. A positive lock between shelf and post is created without the use of any tools. Shelving units may be adjusted or completely changed just as easily. Offered in five finishes: EAGLEbrite® zinc, chrome, Valu-Master® gray epoxy, Valu-Gard® green epoxy, and EAGLEgard® green epoxy. 1836C63 18" x 36" chrome 4-shelf unit with 63" height, redipak® wire shelving. Includes 4 wire shelves and 4 two-piece posts. 1836E63 18" x 36" EAGLEgard® 4-shelf unit with 63" height, redipak® wire shelving. Includes 4 wire shelves and 4 two-piece posts. 1836V63 18" x 36" Valu-Master® 4-shelf unit with 63" height, redipak® wire shelving. Includes 4 wire shelves and 4 two-piece posts. 1836VG63 18" x 36" Valu-Gard® 4-shelf unit with 63" height, redipak® wire shelving. Includes 4 wire shelves and 4 two-piece posts. 1836Z63 18" x 36" EAGLEbrite® 4-shelf unit with 63" height, redipak® wire shelving. Includes 4 wire shelves and 4 two-piece posts. 1848C63 18" x 48" chrome 4-shelf unit with 63" height, redipak® wire shelving. Includes 4 wire shelves and 4 two-piece posts. 1848E63 18" x 48" EAGLEgard® 4-shelf unit with 63" height, redipak® wire shelving. Includes 4 wire shelves and 4 two-piece posts. 1848V63 18" x 48" Valu-Master® 4-shelf unit with 63" height, redipak® wire shelving. Includes 4 wire shelves and 4 two-piece posts. 1848VG63 18" x 48" Valu-Gard® 4-shelf unit with 63" height, redipak® wire shelving. Includes 4 wire shelves and 4 two-piece posts. 1848Z63 18" x 48" EAGLEbrite® 4-shelf unit with 63" height, redipak® wire shelving. Includes 4 wire shelves and 4 two-piece posts. 1860C63 18" x 60" chrome 4-shelf unit with 63" height, redipak® wire shelving. Includes 4 wire shelves and 4 two-piece posts. 1860E63 18" x 60" EAGLEgard® 4-shelf unit with 63" height, redipak® wire shelving. Includes 4 wire shelves and 4 two-piece posts. 1860V63 18" x 60" Valu-Master® 4-shelf unit with 63" height, redipak® wire shelving. Includes 4 wire shelves and 4 two-piece posts. 1860VG63 18" x 60" Valu-Gard® 4-shelf unit with 63" height, redipak® wire shelving. Includes 4 wire shelves and 4 two-piece posts. 1860Z63 18" x 60" EAGLEbrite® 4-shelf unit with 63" height, redipak® wire shelving. Includes 4 wire shelves and 4 two-piece posts. 2436C63 24" x 36" chrome 4-shelf unit with 63" height, redipak® wire shelving. Includes 4 wire shelves and 4 two-piece posts. 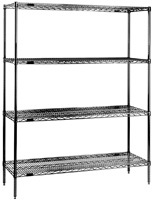 2436E63 24" x 36" EAGLEgard® 4-shelf unit with 63" height, redipak® wire shelving. Includes 4 wire shelves and 4 two-piece posts. 2436V63 24" x 36" Valu-Master® 4-shelf unit with 63" height, redipak® wire shelving. Includes 4 wire shelves and 4 two-piece posts. 2436VG63 24" x 36" Valu-Gard® 4-shelf unit with 63" height, redipak® wire shelving. Includes 4 wire shelves and 4 two-piece posts. 2436Z63 24" x 36" EAGLEbrite® 4-shelf unit with 63" height, redipak® wire shelving. Includes 4 wire shelves and 4 two-piece posts. 2448C63 24" x 48" chrome 4-shelf unit with 63" height, redipak® wire shelving. Includes 4 wire shelves and 4 two-piece posts. 2448E63 24" x 48" EAGLEgard® 4-shelf unit with 63" height, redipak® wire shelving. Includes 4 wire shelves and 4 two-piece posts. 2448V63 24" x 48" Valu-Master® 4-shelf unit with 63" height, redipak® wire shelving. Includes 4 wire shelves and 4 two-piece posts. 2448VG63 24" x 48" Valu-Gard® 4-shelf unit with 63" height, redipak® wire shelving. Includes 4 wire shelves and 4 two-piece posts. 2448Z63 24" x 48" EAGLEbrite® 4-shelf unit with 63" height, redipak® wire shelving. Includes 4 wire shelves and 4 two-piece posts. 2460C63 24" x 60" chrome 4-shelf unit with 63" height, redipak® wire shelving. Includes 4 wire shelves and 4 two-piece posts. 2460E63 24" x 60" EAGLEgard® 4-shelf unit with 63" height, redipak® wire shelving. Includes 4 wire shelves and 4 two-piece posts. 2460V63 24" x 60" Valu-Master® 4-shelf unit with 63" height, redipak® wire shelving. Includes 4 wire shelves and 4 two-piece posts. 2460VG63 24" x 60" Valu-Gard® 4-shelf unit with 63" height, redipak® wire shelving. Includes 4 wire shelves and 4 two-piece posts. 2460Z63 24" x 60" EAGLEbrite® 4-shelf unit with 63" height, redipak® wire shelving. Includes 4 wire shelves and 4 two-piece posts.